How many people have spent countless hours in Skyrim wondering what the game would be like if they added the MMO elements of World of Warcraft? How many people have played World of Warcraft and wondered what it would be like if it had the same depth and level of detail as Skyrim? 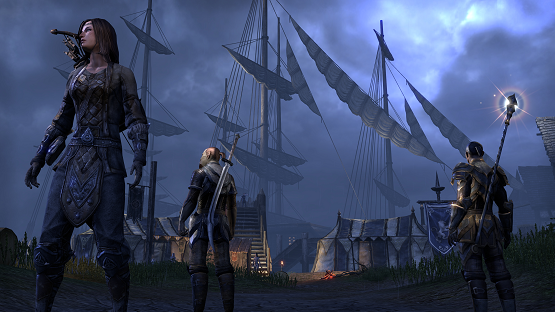 The lovechild of these two worlds is The Elder Scrolls Online, and perhaps the best news of all is that it works. When The Elder Scrolls Online was first announced for PC, I was disappointed that I would not get to partake in the rich online world that Bethesda was putting together. My seat at the Sony press conference turned that disappointment around however, as The Elder Scrolls Online was announced as coming to the PlayStation 4 (with an exclusive beta). I would get to partake in this beautiful marriage as a console player. Bethesda’s booth allowed us to play in a large area of the map with 20 or so other connected players. The game runs very smoothly even given all of the detail in the world. Think of the level of detail in Skyrim and then translate that to this world. It is literally Skyrim as an MMO. You can move individual objects around the game world. You can explore not only the land of Skyrim, but the entirety of the continent of Tamriel. There is even going to be a first person mode, which was shown to us in the theater but not playable at the time, that will make the entire experience actually look like you are simply playing Skyrim with other people. Set 1000 years before the events of Skyrim, the people of Tamriel are divided into three factions in a constant struggle for power. This struggle sets the stage but there will be plenty of other secrets and quests to discover in the game. 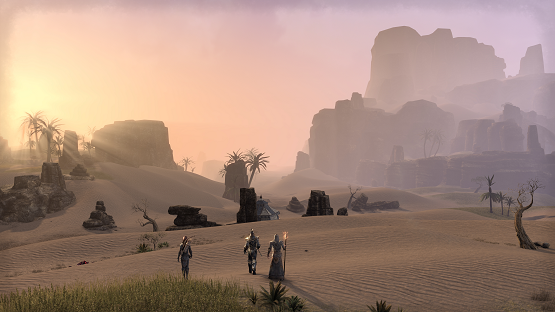 The Elder Scrolls Online will not require you to select a server when logging on to play, but rather will intelligently place you in the world with friends, guild mates, and other like minded players. While the preview demo was showcased on PCs, I was assured that the console version of The Elder Scrolls Online would feature no changes except to the control scheme, which is a testament to the power of the next generation of consoles. Setting up my player offered a ton of different options to choose from such as nine different races that include all of the Elder Scrolls classics. From there, I was shown how to select and set up the large variety of skills exclusive to that race and chosen class. Note that the final version may include more races or classes. This comment was overheard, not told directly to me so I have no additional details on that. The amount of customization for your character goes as deep as anything that you will find in Skyrim, and I was told by a Bethesda rep that what I was seeing for this preview was not the full scope of options that would be available in the final build. Once our characters were built out, Dan and I partied up immediately and easily to take on Tamriel multiplayer. In the town that we started in, various other human players were running around, talking to NPCs and fighting creatures on the fringes of the village. There was a simple quest assigned by an NPC that was assigned to us to put out fires and defeat a few enemies. At the behest of a Bethesda rep, we also took on a quest in a dungeon on the edge of the map that took a little exploration to find and added a little bit of a challenge. If the final build of the game improves on the already deep level of detail, not to mention adding the first person mode, more customization and optimizing controls for the PS4, this will be a title that many will lose hundreds of hours to next gen. 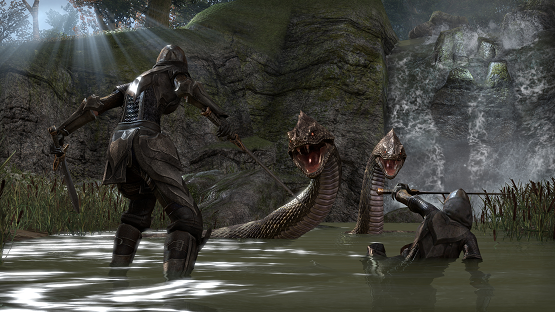 The Elder Scrolls Online is literally a massively multiplayer Skyrim and it’s looking to steal your life. Our time spent with this game impressed us so much that we awarded it with one of our Best of E3 awards.